Tim and Summer lament about whether or not the entry requirements are too hard for the Chronologies contest, since we haven’t received any entries yet. Not a one. Is the contest entry requirement too hard? Seriously, as of 2pm PT, March 11 2009, I have received ZERO entries for this contest. Is this too hard a task for our lurkers and rangers, or does everyone already have the Chronologies book? Tim also relays a note from JMS saying that the studio has completely scrapped the screenplay for the Forbidden Planet remake, so we hope the person that leaked it was held responsible for theft of intellectual property and is now working off a period of indentured servitude in that studio’s salt mines. Contest: We’ve come up with a contest to give away a copy of the B5 Chronologies scriptbook! Can you identify all the voices in the podcast opening montage? If you think you can, submit your entries to contest [at] sliceofscifi [dot] com with the Subject line of Babylon Podcast Chronologies Contest, and include your mailing address. We need all 12 voices correctly identified and in order, and a single winner will be selected from all the people who submit fully correct entries, and participants who helped with the lines are not eligible to enter this contest… maybe next time, gang. 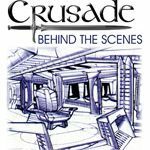 Interview: Captain Jaclyn, Jason Davis and Amy Guskin from the Babylon 5 Scripts Team join us to discuss the new scriptbooks project that’s been kept secret and tightly under wraps until now. 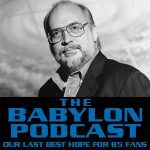 Asked and Answered: JMS answers Thousands of Fan Questions about Babylon 5 is the title of the new series, and it’s an exhaustive compendium of questions ever asked about B5. Starting in November 1991, and current through 2008, the team went through over 20,000 questions from many sources that aren’t available online anymore (online chat transcripts, convention transcripts, etc) in addition to the newsgroup archives from GEnie, AOL and Usenet. It’s arranged in chronological order, without editing, so it’s a rare glimpse at the actual development process as the show is ongoing. Most people have seen some of the answers before, but a lot of work went into establishing the original question with the answer to preserve the original context. 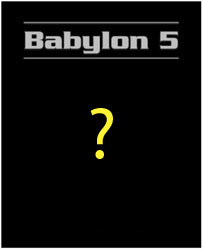 Keep an eye out at the Babylon 5 Scripts store for more details as the official announcement date of March 17th and the release date of April 7th (not April 1st) draw near. Discussion: Tim and Summer nitpick a little more about the contents of these new books, and are looking forward to having the finished product to dig into later. But now Summer won’t get her Crusade books until 2010… grumblefrack. Promo: The Signal Season 5, flying high in 2009! I would love to enter the contest, but my hearing isn’t what it used to be. I am lucky to hear and understand my wife saying ‘Dinner is ready!’ :). Wow, no entries at all to the competition? I gave it a shot, but theres two female voices in there that I can’t identify at all. I might just send in my entry with those two missing, but then I guess it’s not correct enough to go into the draw anyway…. I’m impatient… ideally (for me!) the Crusade books to come out right after the TV Movies book. iirc, they aren’t slated to come out until after these books and the other two Jason are working on are out. I thought they were saying Fall 2009, at the earliest, and from how Tim and I counted, it seemed more like January 2010. I’m going to have to talk to Tim about the contest requirements. Say, on one specific day, we post a hint for the voices, then set like a 12-hr window on that day for people to email in their guesses. First person from those guesses who gets all of the names right will win. Is there a way we could get the script for the opening? I tried to capture all of the words so I could then try to id the voices. I was able to identify 11 different voices. I do have my copy of the book – but I am game to enter the contest. I have a friend that I can gift it to! I already have a Chronologies, so I didn’t try the contest. I do think that the original time frame might have been a bit quick. 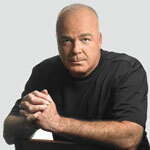 Regarding the debate about why Michael O’Hare left, that is still up to debate because there are so many different versions. In the script book, JMS ultimately says that they had a closed door meeting about it and no one outside of those doors will ever know the real story. From what I’ve read on other websites. jms has been too busy to complete his parts of the Crusade books, so if we didn’t have these next several books, there would be a long break before the Crusade books came out. jms just hasn’t gotten to them. I know, I know… can you tell I really wanted to get a lot more Crusade than TNT gave us? I was eagerly anticipating the premise I’d heard that they’d find the cure but then have to deal with other forces who had a vested interest in not letting that cure be used to save Earth. It didn’t matter that we already knew they’d succeed (given the flash-forwards we’d seen in B5), I wanted to see that story told, and we didn’t get to see it. David: That’s a perfect way to describe it.